Blue Horse Gallery "Public Hanging" Bellingham Wa. "Tulip Festival Art Show" Tulip Valley Winery Mt. Vernon Wa. "New Directions" Juried art show Anacortes Wa. "Birds" Smith-Vallee Gallery Edison, Wa. 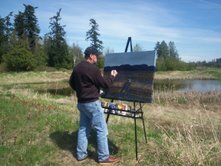 Skagit County Historical Society presents Paint me a River! Contributing artist. Juried Eclectic Art Show, Conway Muse, Conway, Wa. My introduction to art began in my teen years. I purchased an easel and oil paints and set up a studio in my bedroom where I would paint covers of my favorite record albums. In my early 20's, the Skagit Valley College Art Department became my second home and I was fortunate enough to be able to take classes from Sidney Eaton and Orville Chatt. Sidney Eaton taught me the beauty of old buildings and landscapes in the Skagit Valley.One winter in 1973, I remember sitting in the driver's seat of my 1950 Chevrolet Sedan with a canvas propped against the steering wheel and my lap painting an old church in Clear Lake, Wa. After graduating with an Associate of Arts degree, I began a career outside of art and left my passion for painting behind. When my daughter, Katie, became a professional artist, I felt this passion re-emerge. Watching her paint and attending her art shows brought back the passion for art I knew long ago. As I paint, I experience a peace in my soul and spirit. I try to convey the serenity of our beautiful surroundings on canvas. Inspired by Richard Gilkey and Andrew Wyeth, capturing the beauty of nature with an introspective message is my mission.